"A novel way to market exceptional flowers"
The Vanda orchids of Dutch grower Anco Pure Vanda are not only unique because of their aerial roots, but also because of the special blue color of their iconic 'Blue Magic' flowers. To market these already exclusive flowers in a novel way, Steef van Adrichem of Anco Pure Vanda went to talk with Kordaat Product Design, a Westland design agency. The results? A Westland liqueur. Kordaat succeeded in extracting the special color from the flower, and used it to color alcohol. After a lot of research, Kordaat managed to produce three liqueurs. 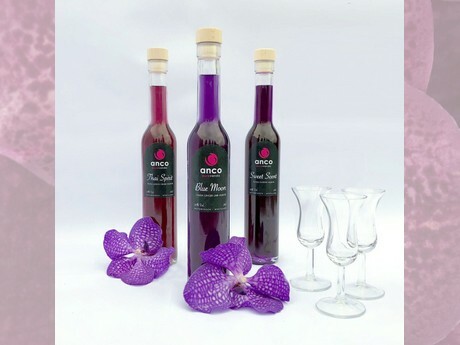 Jens Luiten, Kordaat: "In spite of the fact that the bright colors imply something else, these liqueurs have the pigment from the flowers of the Vanda orchid to thank for their color." Jens: "This project offers a number of opportunities. Liqueur is only one new application of the Blue Magic color. We are convinced that every horticultural product hides something special, making the product increase in value. By looking for such properties, highlighting these, or applying them in a place you do not expect, the Westland and the horticultural sector can become even more valuable than they already are." The men of Kordaat Product Design have been working together for a year and a half. Lucien van der Krans, Hessel Luiten and Jens Luiten have, besides the orchid liqueur, also developed a snack tomato dispenser ('De Tommies Tomaten Tap'). Jens: "Many Westland stories have not been told yet. We want to tell these stories in a nice, effective, and creative manner." Whether that happens by machine, by packaging, or maybe on an online platform, doesn't matter to Kordaat. "The word 'Product' in 'Kordaat Product Design' can be interpreted broadly." Their office on the edge of The Hague offers the possibility to stay completely informed about the wishes of the consumer and regularly visit growers in the Westland at the same time.